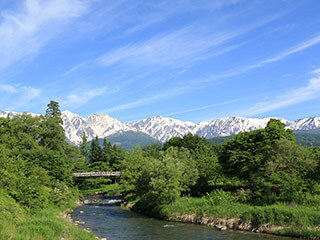 Oide Park (大出公園) is one of the parks with great view of Kita-Alps located in Hakuba, Nagano Prefecture. It is located nearby river and many Sakura Trees that have a beautiful cherry blossom. There is a suspension bridge surrounded by many traditional houses. It is one of the best scenery spots in Hakuba. 1. use a local bus to Hakuba Station. Oide Park is located in Hakuba, Nagano Prefecture. It is located by the riverside of Hime River. It has a stunning view of Kita-Alps. There are tea house that you can enjoy tea. It has a beautiful cherry blossom in the middle of April.